I start off many a new year resolving to keep a journal. When I was 15 or 16 I kept a journal. I wrote in it faithfully and used stenography to record my entries. Anyway, that journal is long gone. I think I probably destroyed it somewhere along the way. Whenever I did and do write in a journal, I always keep in mind that someday, others may be reading it. Therefore, I would and still do self censor. I still have some of those journals. They are more of a record of my day to day activities. I rarely expressed how I was feeling. My blog is now my journal. I am much more open about my feelings here, but of course, there are certain things that will always remain just mine. Bella and Ryan are here for a visit. 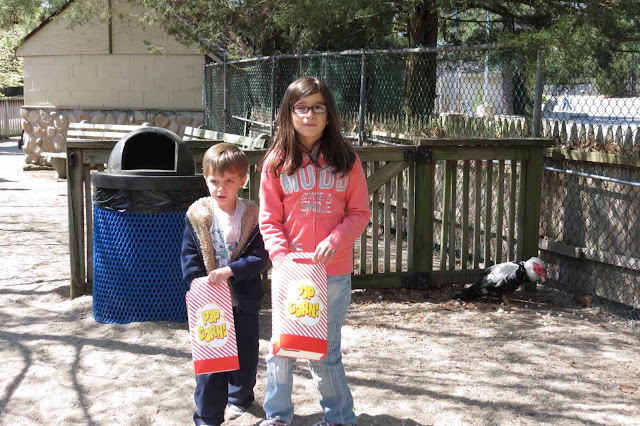 Today we went to the Popcorn Zoo. The kids had a great time. After the zoo we went home, packed a lunch and headed for the beach. Bella and Ryan were very excited about that. I kept telling them it was going to be cold, but they insisted they didn't care. We even brought sand toys. 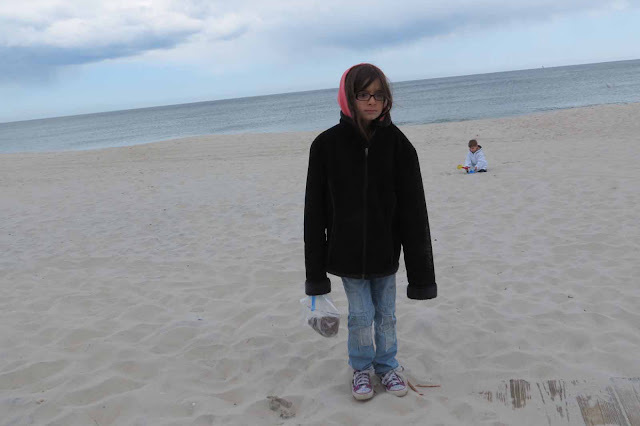 When we got to the beach, it was overcast, and about 55 degrees. I brought a couple of extra jackets for them. At first neither one wanted to wear "grandma's clothes" but after a few minutes they agreed. Bella was not happy. She was freezing and wanted to leave. 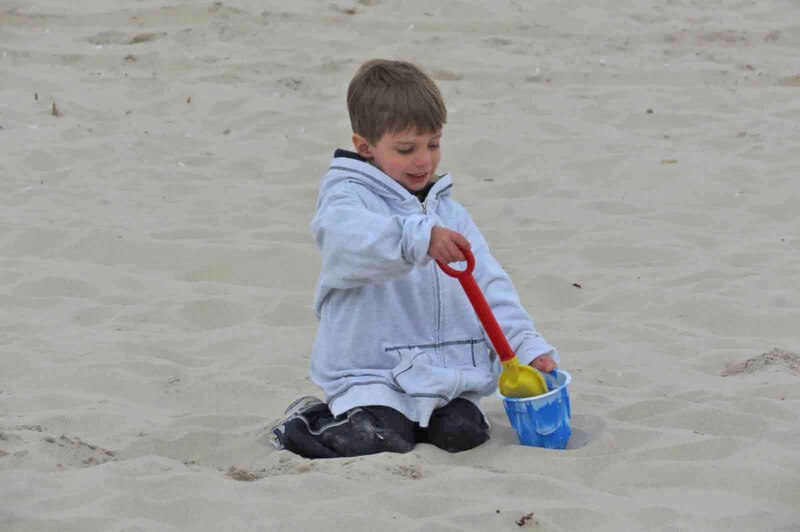 Ryan was quite happy, he wanted to dig in the sand and look for buried treasure. We had to bribe Ryan with hot cocoa and ice-cream, yep ice-cream to get him to leave the beach. We went to the Dockside and that's just what they had. It's now 4:45. I promised that I would let them take a bath in the big tub and then they could get into their pj's. They think that is quite cool, getting into their pj's before dark. Ryan keeps coming in here asking me when it is going to be time for his bath. I keep telling him when I tell him it's time, that's when it will be time. Home in morning. Afternoon Elsie, Minnie and I invited to Rae's for lunch. Got a flat tire and arrived there 2:30. Stayed until 5:30. home. Put Baby to bed early.. He had no nap and was tired. My grandparents used to tell me that, it'll be time when it's time!!! I hated that!!!!! Looks like you're having fun with the grandkids! Enjoy! I have some diaries from my childhood, but they are all just the stuff I did every day, and not even interesting. It's too bad. I'm trying to visit all the A-Z Challenge Blogs this month. I can relate to Bella's disappointment! I wish I could ignore the cold but I have a hard time doing that. And, I must be really cool because I ALWAYS want to get into my pj's before dark! I love your blog. One day I read a journal I'd been keeping years ago. I was whining, crying and complaining. There was also some good pages. I tore out the bad stuff and kept the good stuff. Now when I journal I put anything I want in it. I'm not worrying about anyone reading it because if I'm in heaven when they read it I won't care. I kept a journal for a few weeks, but stopped when I read a few entries and thought my previous concerns sounded stupid. Now I blog, but I've never reread any of my personal posts except the very first one. I'm with you, my blog is my journal/diary. I also agree with Bella.......no cold beach for me either, especially if it's windy. It was pretty cold. I was happy to get to the hot chocolate too. That's interesting that you never re-read your posts. I can think of a couple of reasons why I might want to re-read some of mine. Thank you for complimenting my blog. I guess I have my kids and grandkids in mind when I think about who might be looking at it. But then when I think more about it, I guess they would really know who I am (or was). This morning Bella didn't want to get dressed. She said her pi's were too comfy. Thanks for stopping by. 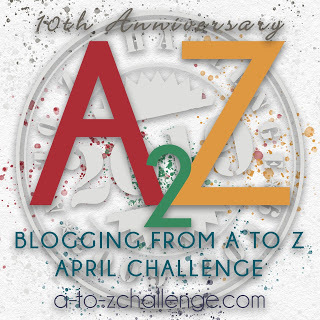 I am also trying to visit every blog in the A-Z challenge. I know, as I was saying it, I thought, about how it must sound to them. Like what kind of answer is that, right?